I have a large number of inexpensive F style bar clamps. We've been together a long time and have a cordial if not friendly relationship. A while back Peachtree Woodworking ran a special on Big Foot clamps where I picked up 4 of the 48" models. They sat wrapped in plastic for three projects; I thought waiting until I had a project that required the 48" capacity of these clamps was a good idea. For the record, that was a stupid idea. 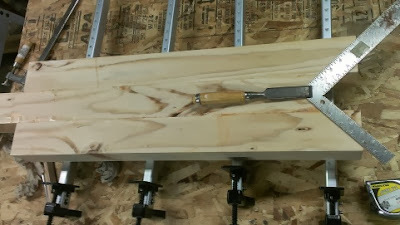 In the photo above you see a saw bench I'm working on. There are actually two, but the second one is more involved and not even started yet. The saw bench is only 12 inches (+/-) wide, but 3 inches thick. The Big Foot clamp has a broad bearing surface; certainly much more than the button on F style bar clamps. The large bearing surface is perfect for a three inch thick glue up. It turns out that the Big Foot clamp is perfect for any project, at least compared to the no-name F clamps. I suppose a little explanation is in order. I use a lot of cauls when gluing things. Cauls make your clamps go a lot further. One caul and two clamps can take the place of a whole row of clamps on a panel (though I always use a caul on each side of the panel). The drawback of using cauls is one more moving part to deal with during glue-up. The Big Foot clamp actually has feet to keep the clamp upright and your project off the table. Additionally there is a broad bearing surface front and back (head and foot? Fore and aft?). My favorite feature is that the feet give enough clearance to turn the screw without interference. I guess Big Foot clamps are my taste of the clamp good life. Maybe I'll make it to the Bessey clamp level some day.